One of two nominees this year from Canada, Dimanche / Sunday is Patrick Doyon’s nine-minute debut short about a young boy’s usual Sunday routine. 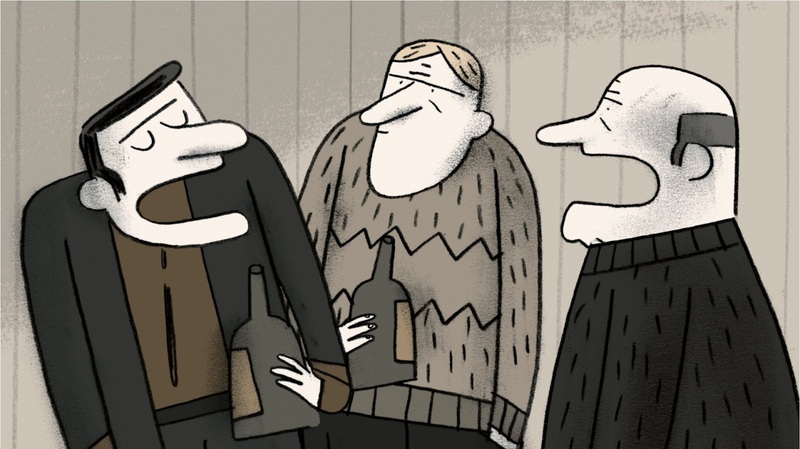 He suffers through church and relatives, but it’s his wild imagination that provides the fun. Between watching his grandfather’s mounted bear head plaque come to life and flattening coins on the railroad outside the house, there isn’t much else for him to do. What makes Dimanche / Sunday unintriguing after a while is the pedestrian nature of its story. It could work if it was entirely about the young boy’s fantasies, but instead we get the frequent habitual nonsense of the adult world surrounding him. It removes us from the boy’s imagination and puts us back in reality, but what’s unfortunate is that the kid’s imagination was never enticing enough to want to go back. The animation is charismatic in its simplicity, but I feel it could have benefited from a more imaginative story. It has its moments, but it ends up being just cute at best. After a year of films that have embraced nostalgia, The Fantastic Flying Books of Mr. Morris Lessmore fits right in. 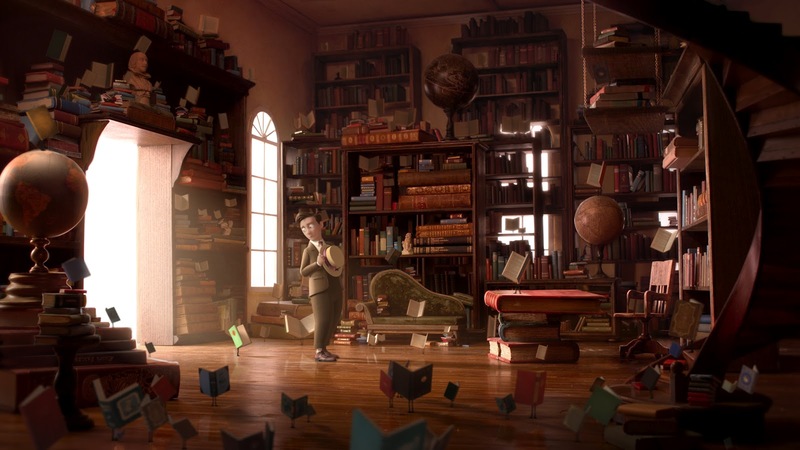 William Joyce and Brandon Oldenburg’s short film adopts the joy of reading and literature and how it affects the life of its titular character. Mr. Morris Lessmore goes from sitting on his balcony in New Orleans to a dreamlike land via a wicked hurricane (stirring up obvious allusions to The Wizard of Oz and Hurricane Katrina). In this dreamland he stumbles upon a house filled with books and revels there until he grows old. It reminded me of “Time Enough At Last”, an episode of The Twilight Zone, just given the Disney treatment. What’s problematic about this otherwise enjoyable film is that it struggles to convey any reason. Not that I require a straightforward explanation – it is a fantasy after all – but the narrative needed a little more sense so its lack of dialogue doesn’t just seem like an easy way out. What was it really saying besides “Books are great!”? That books can heal the soul? That’s a little too Chicken Soup for me. It has gorgeous mixed animation and a blasé message that everlasting literature equals happiness, but that oftentimes feels like that’s all it has to offer. With a running time of 17 minutes, I guess I just expected a more fleshed out story. My opinion aside, I’d say this is a dark horse for the Oscar win. It has the nostalgia factor that seems to be popular this year, a great deal of emotion, and stunning animation (the hurricane sequence was absolutely stellar). Pixar is what you automatically think of when you hear “animation” – besides maybe their production partner, Disney. They are simply the best. However, they haven’t won the Oscar in this category for 10 years now. 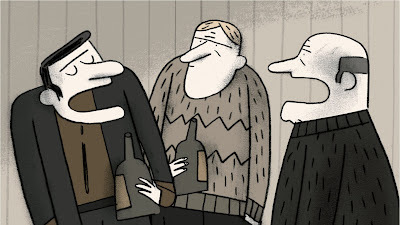 The last time they took home gold for Best Animated Short Film was for For the Birds in 2002. They’re basically the Meryl Streep of this category, but something tells me it’s their year this time around. Without a feature competing for the Best Animated Film award, La Luna is Pixar’s only chance at gold this year. Directed by first-timer Enrico Casarosa, a story artist for the studio, this 7-minute short may be Pixar’s best in years. It depicts three generations of moon sweepers – a young boy in training, his father, and his grandfather – who row out to sea, set up a ladder, and make their way up to the moon to clear moon rocks from the surface. La Luna easily has the most attractive animation of the nominees and also has the most concise narrative (Morris Lessmore could take a page from this book, no pun intended). It’s simple, yet engaging, solemn, yet absolutely vivid. The film is like a painting; it offers a wonderfully sparse backdrop that lets us focus on the characters and, of course, the moon itself. In many ways, La Luna reminds me of Hugo. It features the same colour palette (blues and golds) and deals with a quasi love affair with the moon. Out of all the nominees, I think this one is the most child-friendly. It plays like a pop-up book and reminded me of the stories of my youth. It’s downright charming and a wonderful addition to the Pixar canon. Based off of the short story “The Chicken” by Casper G. Clausen, A Morning Stroll plainly depicts a person noticing a hen hopping down a city street to a building, knocking on the door, and being let inside. Simple, yet surreal in its approach, director Grant Orchard plays us this mundane happening three different times, each in a different time period and style of animation. A Morning Stroll is without a doubt the most original contender for the Oscar; it’s refreshing seeing a film that masters variety and brevity – and in under 8 minutes to boot. The first sequence is in this classic, 50s style with basic animation. It even has the flicker of an old projector and random cigarette burns across the screen. 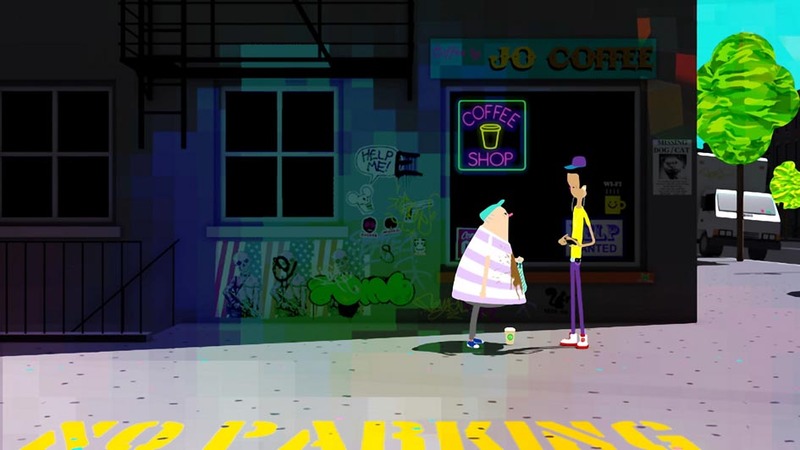 The second sequence is a modern take on the story setting it on a graffiti laden New York street. Its sharp colours, pixilated design, and hip hop music set the tone and the message of technology dependence is both humourous and relevant. The final sequence has a post-apocalyptic setting filled with blood, carnage, and zombies. After a zombie tries to attack the chicken and fails, there’s a quirky ending that ties up this inventive short in a neat little bow. In 1999, directors Amanda Forbis and Wendy Tilby were nominated for this same prize for their film When the Day Breaks. Whereas that film dealt with animals living like humans in the big city, this one centers on a young British man who moves out to the barren Albertan country to become a cowboy. The directors impart a lot of regional specifics into this film and someone who isn’t from the Canadian mid-west might not relate, but the film transcends locale and gives us an almost cosmic portraiture of an independent wannabe. The protagonist tries so hard to be a rancher, but fails at every attempt. He’s alone as the harsh Canadian winter approaches and although he’s suffering, he writes letters to his family back home saying that he is doing better than ever. Once in a while, there are intertitles inserted amongst the story with details about comets. The young man’s journey parallels an incoming comet that is heading towards Earth giving this story an allegorical aspect. While this film may not translate to an international audience, it most certainly tells a universal story of loneliness and failure. Sometimes eccentric and sometimes morose, this film is the most realistic and humanistic one of the bunch. It features wonderful hand drawing and painting on film cells and the story and visual design go hand-in-hand to give us the feeling of the cold Albertan frontier. 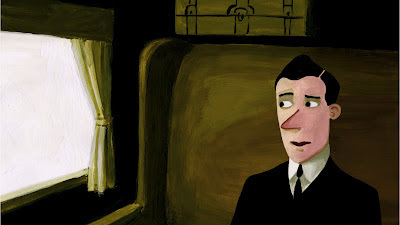 The 2012 Oscar Nominated Short Films open today, 2/10, in 200 theaters nationwide. DVD Review | "The Woman with the Five Elephants"
Blu-ray Review | "On the Bowery"
Review | "The Turin Horse"
Review | "The Miners' Hymns"
Blu-ray Review | "A Star is Born"
Blu-ray Review | "La Jetée"/"Sans Soleil"
Review | "Carol Channing: Larger Than Life"
Blu-ray Review | "Annie Hall/Manhattan"